We welcome new friends to join us for Friendship Sunday and the Fall 2018 program begins, based on Michael Singer’s powerful book, the untethered soul. Join us! This Sunday is Friendship Sunday! We hope you’ll invite a friend to come along to enjoy the service and the potluck social which will be held immediately following the 11:00 am service. Our Youth Program is also held at 11:00, so it is a great time to bring the family and see what Unity Palm Harbor is all about! We will be welcoming our new members this Sunday as well during both the 9:30 and 11:00 am services. We are also kicking off our Fall program based on Michael Singer’s fantastic book, the untethered soul. Reverend Bob’s talk this Sunday is aptly titled Untethered Souls and it will be a preview of the program which will cover the next five weeks. 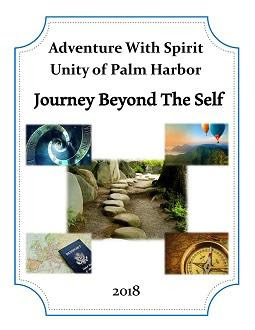 Services will feature concepts from the book, which is available at the Unity of Palm Harbor bookstore. In addition to the Sunday services, you have the wonderful opportunity to join the course that goes with the Fall series. It’s not too late to get in a group for our 7-week Fall Program. The program kicks off Sunday Sept 30 and ends the week of Nov 11th. Please see the map and information on each group in the foyer; then choose to day, time and location that suits you best..
You’ll need both the workbook and the book for the small group classes. You can also purchase these for your own use at home. Bring a dish or dessert to share to celebrate friends and the great community we have at Unity of Palm Harbor. We’ll have our potluck in the Heritage Building and on the grounds immediately following the 11 AM service. Sign up for our weekly newsletter to stay up to date on everything that Unity of Palm Harbor has going on.